Many of you have emailed and called to ask for an updated version of our sewing syllabus that includes some of our newest patterns. So here it is. I’m thrilled that so many of you are making good use of the patterns to improve your sewing skills. You know the basics of how to operate your sewing machine, but you’ve never sewn a garment. Here’s your place to start. 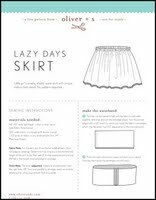 Lazy Days Skirt: This free downloadable tutorial will help you get comfortable with your machine and will allow you to demonstrate to yourself that, yes, you can sew a garment. This very easy tutorial doesn’t involve an actual sewing pattern and is a perfect place to start for absolute beginners. It also involves a minimum of supplies. You’ll learn to make a simple elasticized waistband and a very easy ribbon hem that gives the skirt its finished appearance. This skirt doesn’t even require you to finish your seam allowances, so it’s fast and simple to make. Popover Sundress: This free download for a simple sundress provides a good introduction to sewing from a pattern. It also teaches you how to apply bias binding, which is frequently used in sewing projects. You can also have fun with combining different fabrics and adding a variety of trims to this dress. Music Box Jumper: This is an easy beginner’s pattern with some elegant details that results in an impressive finished dress. The pleats and buttonholes are slightly more challenging than the Popover Sundress but still very manageable. If you simply can’t bring yourself to try buttonholes yet, use snaps instead of buttons. Music Class Skirt: The skirt portion of this pattern is very simple, but the finished results are quite impressive. You’ll learn how to make simple pleats and a very easy built-in pocket on an elastic-waist skirt that builds on the ease of the Lazy Days Skirt tutorial. Sketchbook Shorts: These shorts look impressive but are very simple to make. They include easy pockets and a waistband that can be elasticized all the way around or only in the sides and back for older children. The short are the same difficulty level as the Music Class Skirt, but this pattern is for boys and girls. Nature Walk Knit Pants: This simple pattern will help you to conquer any fears of sewing with knits, and you’ll be shocked at how easily and quickly the pants come together. Ruffled Halter: Learn clever construction techniques to assemble this cute little top with easy raw-edge ruffles. You’re able to sew from a pattern, and you’re eager to learn basic garment construction techniques. Our patterns rated one scissors in difficulty are designed for sewers at this level. Bedtime Story Pajamas: This pajama set features simple elastic-waist pants and a bias bound kimono top. You’ll gain experience cutting out and assembling pants and a top without needing to worry about more detailed elements like buttonholes. The sleeves are fantastically simple to assemble, and you might try combining unusual fabrics for the bias trim and ties. Sandbox Pants: This pattern allows you to create a great looking pair of pants with some interesting details that are fully within the reach of a new garment sewer. This project will teach you how to make simple pockets and will give you practice making buttonholes. The pants have a simple combination elastic/drawstring waistband which is slightly more challenging than the one on the Bedtime Story Pajamas. Sailboat Top, Skirt, and Pants: This pattern provides a simple pair of cropped pants, a skirt, and a top that can all be made by someone without a lot of sewing experience. The details of the finished garments (decorative topstitching, buttons and button holes on the flat-front skirt and pants) provide a high satisfaction quotient for the novice sewer. You’ll learn to set in an easy sleeve and will be amazed at how simple it is to construct the pants and skirt—with no zippers! Tea Party Sundress and Playsuit: This is also a one scissors pattern, but it is slightly more challenging than our other one scissors patterns. Using this pattern will teach you how to make a curved seam and how to use flat piping. The sundress will introduce you to our innovative hem facing, which is ideal for finishing flared skirt hems. Nature Walk Pullover: This pattern for a simple layering piece will introduce you to some simple details that look professional when finished: pockets, sleeves, and a collar. You’ll be thrilled with the results, and you can have fun combining fabrics for different results. Hopscotch Skirt, Knit Top + Dress: Whether you want to improve your knit sewing skills with the top or dress or try some easy dressmaking details with the woven skirt, this pattern will expand your repertoire gently. The knit top/dress has easy gathers in the front yoke seam, a self neckband, and a simple set-in sleeve. The skirt includes a fun and manageable pleated pocket, front button placket, and a simple elastic back waistband. You no longer consider yourself a beginning sewer. You’re comfortable with your machine and with following a pattern. You’ve made a few garments, and you’re pleased with the results you’ve achieved. Our two scissors patterns are perfect for this level. They are a little bit more involved and challenging to sew because they introduce interesting new construction techniques, but they provide great results for the extra effort. Ice Cream Dress: This unique little pattern will show you how to finish the inside of the dress to look almost as nice as the outside! The easy button loop means no buttonholes or other closures, and you’ll get a chance to practice pivoting to create the little V-shape notches at the front neckline and pockets of View A.
Sunday Brunch Jacket and Skirt: This tailored, unlined jacket will get you comfortable with sewing sleeves, gathers, and collars. As a result, it provides a slightly greater challenge—but also several opportunities to pick up new skills. The unlined jacket also gives the opportunity to practice bias binding, if you should choose to finish the interior seams this way. 2+2 Top and Skirt: This pattern features a unique placket and gathering treatment on the front of the blouse, bias binding at the neckline, and a button placket at back. The simple pleated skirt features a side placket. This pattern offers opportunity to develop your construction and technique skills while working on these features. Chances are that you’ll surprise yourself with your new sewing abilities once you’ve completed the outfit. When you’re ready to invest a little more time and take on a greater challenge, our three scissors patterns are ready for you. They feature full dress making details and, consequently, require a greater time investment to complete. But the outcomes are totally achievable (thanks to our detailed instructions) for an intermediate sewer looking for a new challenge. Music Class Blouse: Try your hand at some simple pintucks in this blouse pattern. The one-piece collar and short sleeve look terrific despite being quite easy to sew. Once you’ve gained a little confidence, try the long sleeve version of the blouse with a placket at the cuff. Sketchbook Shirt: Like the Music Class Blouse, this pattern looks impressive while actually being very manageable. The one-piece collar looks much more difficult than it actually is. Using this pattern, you will sew a button placket, and you can choose the short sleeves for an easier version or the long sleeves with placket at the cuffs when you’re ready. 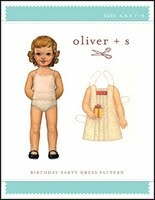 Birthday Party Dress: You’ll gain experience sewing pleats, and you will use using accurate stitching to create the facing. You will experience a new and unique placket construction when you sew from this pattern. Jump Rope Dress: This pattern includes lots of little dressmaking details that will make you feel like a professional when you see the results! You’ll use accurate stitching to make a partial placket and a sweet little collar. The you can choose between the gathered dropped-waist skirt with belt and belt loops or the simpler A-line version of the dress. School Photo Dress: This unique dress includes a kangaroo pocket at the front, an invisible zipper, and a lining. The kangaroo pocket requires stitching precisely to several points, which will allow you to practice accuracy in stitching. You’ll be pleased at how easy it is to insert an invisible zipper, and the lining finishes everything nicely. This pattern requires a little more time than some of our other patterns, but the extra effort pays off beautifully. School Days Jacket and Coat: Using this pattern will allow you to create a fully lined jacket or coat. You can even opt to make a removable, quilted lining. You’ll get experience sewing with laminates or wool. Sewing from this pattern is more time consuming than most of our others, but it will return excellent results for the investment. You’ll be amazed that you made it yourself! Thanks, Liesl! I found last year’s syllabus invaluable. (My only question would be about the difficulty of the ruffled halter). Thanks for this great list. What about the Jump Rope Dress? Thanks! Where does the Jump Rop Dress fit in? Oh, I forgot the Jump Rope Dress! Will add it shortly. My apologies. Will also add the ruffled halter into the mix. Thank you so much for updating your list! 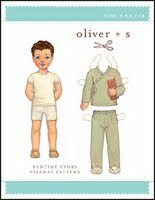 The bedtime story pj pattern is out of print? Is there someplace who has them on hand? I’d LOVE to make those. Would it be possible to update the “learn to sew syllabus”? My sister wants to learn to sew for her daughter and I’m sending her here to learn. Stephanie, we may update that at some point. 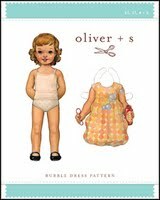 But now that all our patterns are available digitally, everything on this list is still available. So the list is still good. And since this was published, we have added a Skills Used section to all our pattern descriptions which should help her determine if she is ready to tackle a newer style. I hope she finds it helpful!